In the middle of a hurricane, Maria Sirena tells a room full of sheltering women the story of her life. Spanning three revolutions and multiple generations, it is a story full of love and loss set in the beautiful and exotic Cuban landscape. The Distant Marvels is a marvel itself, full of poetry and lyricism, love, and reflections on life and storytelling. This is the best summer read you could imagine for the person who doesn’t actually like summer reads--and who isn’t afraid to finish it in privacy as it breaks the heart three different ways. Maria Sirena tells stories. She does it for money—she was a favorite in the cigar factory where she worked as a lettora—and for love, spinning gossamer tales out of her own past for the benefit of friends, neighbors, and family. But now, like a modern-day Scheherazade, she will be asked to tell one last story so that eight women can keep both hope and themselves alive. Cuba, 1963. Hurricane Flora, one of the deadliest hurricanes in recorded history, is bearing down on the island. Seven women have been forcibly evacuated from their homes and herded into the former governor’s mansion, where they are watched over by another woman, a young soldier of Castro’s new Cuba named Ofelia. Outside the storm is raging and the floodwaters are rising. In a single room on the top floor of the governor’s mansion, Maria Sirena begins to tell the incredible story of her childhood during Cuba’s Third War of Independence; of her father Augustin, a ferocious rebel; of her mother, Lulu, an astonishing woman who fought, loved, dreamed, and suffered as fiercely as her husband. Stories, however, have a way of taking on a life of their own, and transported by her story’s momentum, Maria Sirena will reveal more about herself than she or anyone ever expected. Chantel Acevedo’s The Distant Marvels is an epic adventure tale, a family saga, a love story, a stunning historical account of armed struggle against oppressors, and a long tender plea for forgiveness. It is, finally, a life-affirming novel about the kind of love that lasts a lifetime and the very art of storytelling itself. Chantel Acevedo was born in Miami to Cuban parents. She is the author of A Falling Star (Carolina Wren Press, 2014), Love and Ghost Letters (St. Martins, 2006), winner of the Latino International Book Award, and The Distant Marvels (Europa, 2015). Acevedo is an Associate Professor of English in the MFA Program of the University of Miami. "Acevedo here makes a significant contribution to contemporary literature...This is a major, uniquely powerful, and startlingly beautiful novel that should bring Acevedo's name to the top echelon of this generation's writers." "Rich and engrossing...quite aside from the human perceptivity and warmth that distinguish The Distant Marvels, is a writing style of an elegance rarely encountered in contemporary fiction." 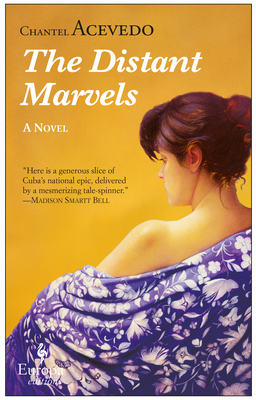 "The Distant Marvels is a wonderful story about the stories we tell each other and what they reveal about ourselves." "Acevedo takes a great story to another level with her remarkable storytelling." "Irresistible moments of rebellion and bravery define this tale." "As Hurricane Flora blows past Fidel Castro's new Cuba, Acevedo's heartbreaking and humane novel comes to a memorable conclusion." "A modern riff on Scheherazade that celebrates the art of the story." "Acevedo's prose has an endearingly relaxed feel-like she's sitting across from you and telling the tale." "With enchanting novels such as A Falling Star and The Distant Marvels, Acevedo hovers between poetry and prose, romance and history, nostalgia and modern life."